The Upper Aire Catchment is located in one of the most picturesque parts of the country. Fisheries officer Pete Turner talks about his work in helping it be a haven for all. If Yorkshire is God’s own county, the Upper Aire Catchment can be considered to be at its very heart and soul. The tiny streams in the hills feed into the main artery of the River Aire as it scythes through the Yorkshire Dales, supplying the industrial powerhouses of Bradford and Leeds, before joining into the River Ouse at Goole. It’s not hard to appreciate the spectacular beauty of some of the scenery, but this belies a series of challenges that have meant that wildlife, and particularly fish, were struggling to get a foothold in some areas. How did we go about addressing the problem? Our project fitted naturally with wider national aims. Colleagues across the Environment Agency had taken part in the huge task of gathering information and making the assessments, and we were left with a brilliant picture of not only the health of our rivers and streams, but what was impacting on them. With a number of diverse issues to consider, we needed to decide which were within our powers to fix, and what would offer the greatest value for money. We worked with project partner, Yorkshire Wildlife Trust (YWT) to ‘walk over’ the majority of the catchment – this meant mapping sources of sediment and collecting information such as land use, vegetation and presence of non-native species. This allowed us to rank the sources, identify key landowners, and talk to them about doing work on their land. What are the specific issues affecting fish in the Aire? 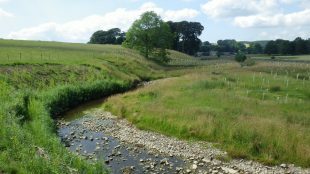 In the headwaters of the River Aire and its tributaries, sediment is the main issue for fish impacting on their ability to spawn. 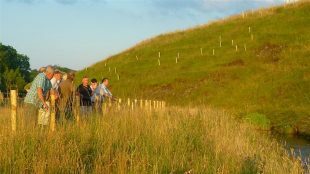 It was important that we worked with the local farmers and focused on adding ‘buffer strip fencing’ on their land – this means specialist fencing which keeps cows out of the river. We need to combine this with riverbank restoration and a policy of planting trees to absorb rainwater as it flowed down the hilly catchment. 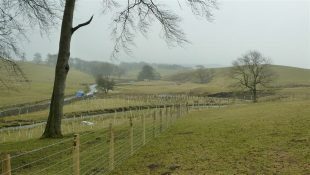 Alongside our partners at Yorkshire Wildlife Trust and Yorkshire Farming and Wildlife Partnership, we established a demonstration site to show the difference that buffer strip fencing and selected planting would make. How well has this been received? Since 2011, we have worked with more than 60 landowners and have covered around 9,250 hectares of land. We have raised awareness of the sources of diffuse pollution and shown just what is possible. As a consequence, more people have joined the project and we have been able to share best practice. In 2015, our project won an award at the Wild Trout Trust Conservation Awards in recognition of the difference it has made to the area. We have also won a Green Apple Award this year in the Environmental Best Practice category. We have delivered presentations about the project to a number of key influencers, and I was invited to speak at the Institute of Fisheries Management (IFM) Fisheries and Farming Conference earlier this year. What will be the legacy of our work? It will be a long road before we see fish numbers increasing to levels we want to, but I’m confident the work of the Upper Aire Project has not only changed the health of the upper River Aire, but has changed the mindsets of many landowners too. We have planted more than 80,000 trees while managing the invasive species that potentially threaten their existence. We’ve been able to increase the amount of wet woodland Biodiversity Action Plan habitat in the area, and bring about positive change in terms of flooding risk and agricultural pollution. I firmly believe that these measures will lead to improved water quality and better habitat in the watercourses. Life never stands still in the Environment Agency and I’m pleased to confirm that colleagues are already working on the next major project! Developing the Natural Aire, will focus work on tackling barriers to fish passage on the main River Aire, which should allow the natural salmon and sea trout population even easier access to the habitat the Upper Aire Project has created. Fish farming - how hard can it be? Great teamwork and an excellant project that looks at the big picture. When you see the extent of the work done on the river Ribble by their rivers Trust, you can see the net gains to be achieved. It would also be good if via lottery funding if some of the larger players like the RSPB. And National Trust could be persuaded to take owner ship of land in the urban and semi urban areas to created well managed space for both wildlife and humans. A good area to do this would be on the wash lands of the river Aire between Keighley and Skipton. An exempler of this type of project is the enlargement of the Wicken Fen in Cambridgeshire. Not only is it providing this massive new green lung for the people of Cambridge ,but it is massively widening the habitat for the flora and fauna that hung on precariously from the remnent historic fen.